Colostrum is a special immune-active fluid secreted by a female cow for about three days after giving birth. 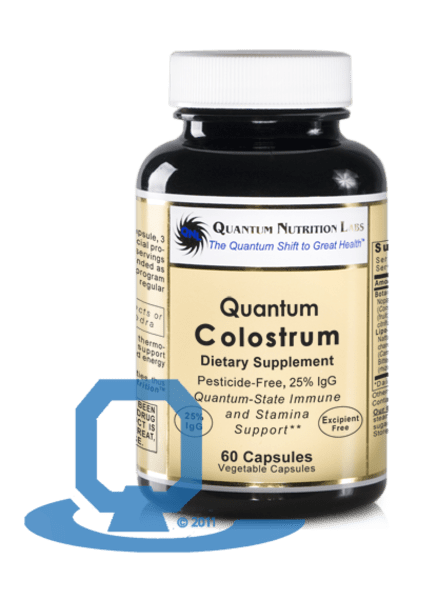 Quantum Colostrum is made from 100% whole bovine colostrum that is not defatted and pesticide-free. 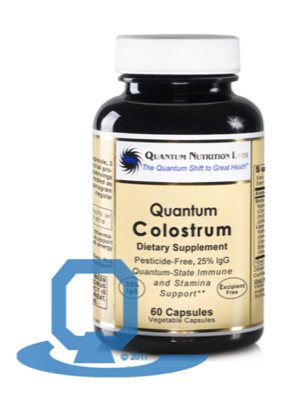 Quantum Colostrum typically contains 25% immunoglobulins (IgG) (88 mg/cap) for effective immune support. In addition, this concentrate delivers a full spectrum of multiple immune support agents including lactoferrin (3 mg/cap), N-acetylneurominic acid (4 mg/cap) and IGF-I (445 ng/cap) [typical amounts]. Stabilized rice protein, vegetable cellulose capsule. 60 caps (Bovine Colostrum each 350 mg).